Imagine your child starting each school day in prayer with teachers and the school principal, asking God’s help and blessings on their work and relationships. Imagine a place where students help each other on the playground, where 8th graders guide kindergarteners and talk about things like virtues and saints. 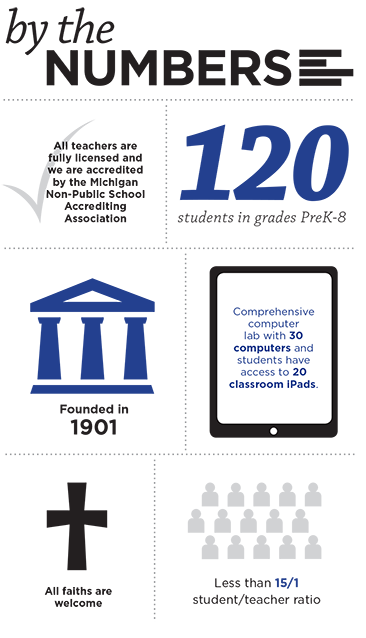 Imagine a place where you can be assured that your child is receiving an excellent education with up-to-date technology, while still making room for you to be fully involved in your child’s education. 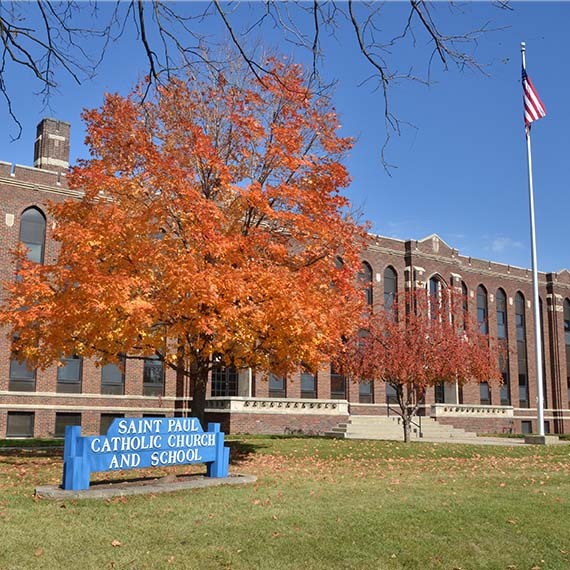 Welcome to St. Paul Catholic School, where you will find all of this and more, including plenty of sports, clubs and activities. We offer a welcoming family atmosphere that is supportive of your role as your child’s primary educator. With our small class sizes, caring teachers and focus on faith, will make your child, and you, feel at home. For 114 years, St. Paul Catholic School has provided a solid foundation for children’s spiritual, academic and social growth. For many, sending their children to St. Paul is a family tradition that leads to outstanding lives, centered on faith and family. Start your own family tradition with us today. At St. Paul Catholic School we strive for excellence in faith and academics. Our mission is to be a loving and forgiving community that receives our Lord Jesus Christ and reflects his teachings. God is our focus and heaven our goal. St. Paul School provides an inspiring academic environment. Fully accredited by the Michigan Non-Public School Accrediting Association, we offer low student-teacher ratios, a challenging curriculum and highly qualified and dedicated teachers. When students leave St. Paul to attend high school, they are prepared and many graduate high school with high honors. In addition to our core curriculum of reading, religion, math, English, science and social studies, we offer physical education, computers, creative writing, music, library and Spanish. By beginning and ending our days in prayer, and learning about saints and virtues daily, we teach students that faith can be part of their everyday life. In addition, our students attend daily religion classes in each grade level, and learn about God through weekly student-led Mass, special activities like living rosaries, and Christian service projects including our weekly food collection and Student Council projects. Students also participate in sacramental preparation and other faith-based activities throughout the year. Our doors are open to families of all faiths who are interested in a quality education. We offer a wide variety of extracurricular and enrichment activities to help our students experience the benefits of teamwork and strive for excellence both inside and outside of the classroom. 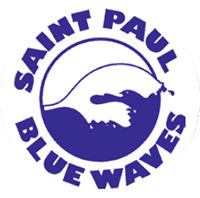 Blue waves can enjoy chess, choir, drama, robotics, science and Spanish clubs alongside volleyball, Girls on the Run and basketball. Students also participate in football through the Genesee County Catholic Schools Athletic League and other sports through the Lansing Catholic Youth Activities Conference. If you are interested in sending your child to St. Paul but are concerned about the cost, come talk to us. Scholarships, family discounts, tuition payment plans, and other options are available to help make it affordable for all.